Athlete’s foot and fungal nails are strikingly common. So many environmental factors can contribute to them, from your socks and shoes to heat and humidity. Sometimes weakened immunity from disorders, such as diabetes, can be a cause. On the feet, fungus can grow on and between toes, as well as on soles and toenails. At Cherrywood Foot Care, we’ve observed that chronic fungal infections are most common in adults, while acute fungal infections are seen more often in children. We’re here to help. Athlete’s foot thrives in moist, warm places where people often walk barefoot, such as public showers or around swimming pools. A chronic infection caused by various types of fungus, this condition ranges from mild scaling and itching to painful inflammation and blisters. It usually starts between the toes or on the arch of the foot and may spread to the bottom and sides of the foot. Depending on the type of infection you have, various kinds of medication may be used to treat your fungal problem. Successful treatment usually involves a combination of medication and self-care. If your condition is not serious, over-the-counter and prescription powders, lotions, or ointments can often help treat scaling, itching, and inflammation. Consult Cherrywood Foot Care before taking any medication. Foot soaks may help dry excessive perspiration, but contact our office first. If your Athlete’s foot does not improve, we may prescribe stronger medication. Fungal nails are usually more resistant and more difficult to treat than Athlete’s foot. Cherrywood Foot Care‘s team of podiatric experts may prescribe topical or oral antifungal medications. If the problem is severe, permanent toenail removal may be an option. 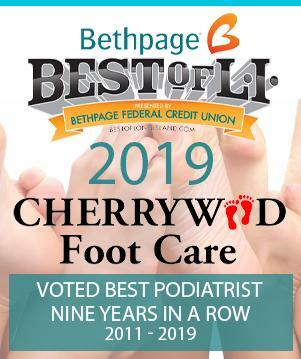 Check out Cherrywood Foot Care‘s cutting-edge laser treatment for a quick and painless solution to this common ailment. Keeping the fungus under control will help prevent a fungal infection of the skin from reinfecting the nail. Before bed, thoroughly wash and dry your feet, and apply a non-prescription anti-fungal cream to the entire foot, from the ankle down. Use the cream every night, then gradually apply it less often. Keep your feet dry. Dry feet are less likely to become infected. Apply powder to your dry feet after you take a shower or bath.